Keeping in mind the rampant evil of Love Jihad and frequent attempts at provoking caste hate by enticing girls across caste divide by elements directed by the urban naxal clique, Pattali Makkal Katchi (PMK), led by Dr. S Ramdas, has set in motion a discussion. The Lok Sabha election 2019 manifesto of PMK makes a reference to “parents’ consent” to recognise marriage of girls below the age of 21. It cites the environment of sexual abuse and harassment plaguing Tamil Nadu. The manifesto states that countries such as Singapore, Philippines, Japan and Brazil made parental consent a requirement to marry at a very young age. Parental consent laws (also known as parental involvement laws) in some countries require that one or more parents consent to or be notified before their minor child can legally engage in certain activities. Parental consent may refer to a parent's right to consent to their minor child marrying before he or she reaches marriageable age. In essence, PMK wants girls who wish to marry under the age of 21 to seek parental consent to prevent the girls from being cheated and – most important – “to safeguard family structure”. Modi Campaign has become #people's campaign. 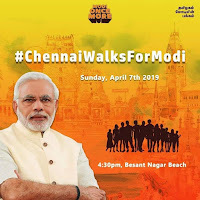 search social media with this hashtag, you will find volunteers, aam aadmi log campaigning for team Modi. Commute songs in Mumbai, Marathon couple in Kolkata, group of women distributing notices in Bengaluru... So can Tamilnadu be left behind? 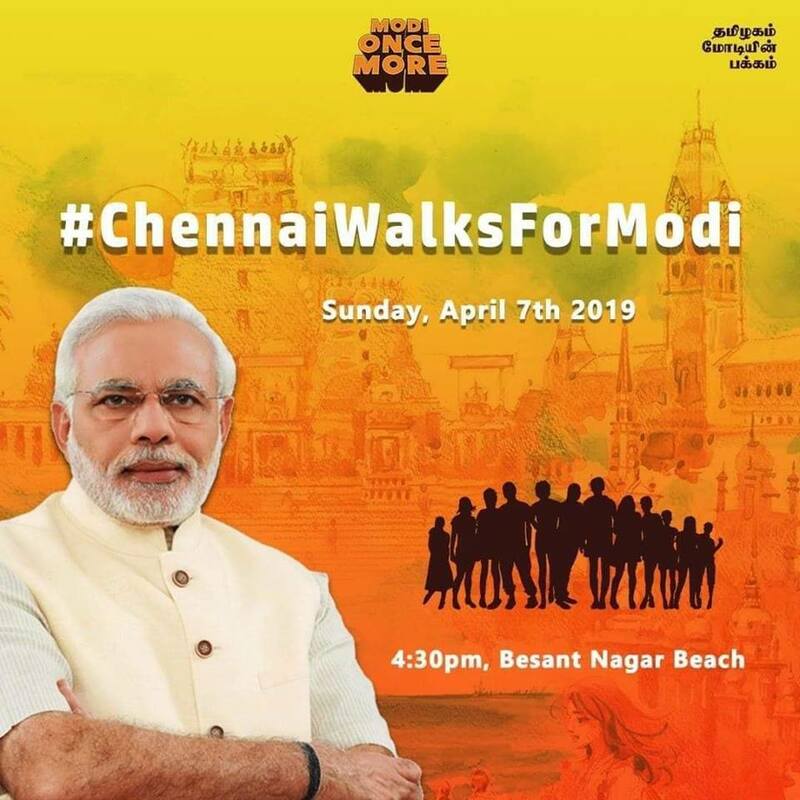 Last week,Chennai saw, Walk for Modi campaign where hundreds wearing "Namo Again" T shirts came in solidarity to campaign for their favourite leader to be elected again. Not only common men, but also, it is new that Sadhus and sannyasis of TN are voicing support for NDA . In a meeting called for by Swami Ananntha Padmanabhachariar - APN Swami at the famous Mylapore mangollai, he appealed to all to vote for the government which protects Hindu interests. Sreemath Sampathkumara Shendalangara Jeeyar, Swami Omkarananda of Vedapuri all expressed their support for a government which protects Hindu culture of this country. Earlier Bangaru Adigalar of Om Shakti Peetam,Melmaruvthur also voiced his support,which created ripples in the state. Hindu religious heads expressing themselves openly in favour of a pro Hindu dispensation at Centre. It is the 12.66 acres of land in the heart of Erode, a district headquarters in Tamilnadu usurped by the Church of South India (CSI) is in the news again. The land area measuring 12.66 acres was officially declared as ‘poromboke’ by the Settlement Tahsildar in 2012 after a united and stiff struggle by Hindus led by the Committee. 'Movement for Retrieving Periya Mariyamman Temple Land' organized the annual grand Mariamman festival that draws devotees in lakhs to Erode that take place in April. The Committee urged the State government to initiate immediate efforts to retrieve the lands belonging to the temple from encroachers. A large number of women from different parts of the town gathered on the Eshwaran temple premises and lit the lamps before carrying them in a procession, which culminated on the Periya Mariamman temple premises. Retrieval of the land will enable conduct of temple festivities thereby preventing the congestion along the Brough Road. This year too thousands of devotees participated in the protest under the leadership of Shri E R M Chandrasekar on April 4. Hundreds of traders and workers outfits as well as Hindu organisations expressed solidarity to the movement.